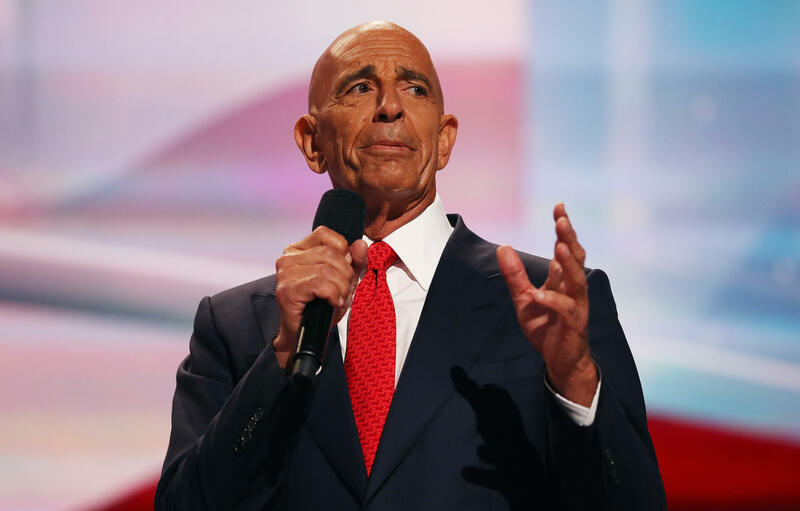 Tom Barrack, longtime friend of President Trump, delivers a speech at the Republican National Convention on July 21, 2016, in Cleveland, Ohio. President Trump's longtime friend Tom Barrack has been getting a lot of attention lately — much of it not good. Barrack was the chairman of Trump's inaugural committee, which is now under scrutiny by federal prosecutors. He was roundly criticized for comments he made this month about the killing of Saudi journalist, Jamal Khashoggi. And this week, Barrack's name came up in a report from the House Oversight Committee about a possibly illegal effort to transfer nuclear technology to the Middle East. That's a lot of heat for the man who introduced himself at the Republican National Convention three years ago as "the son of a very humble Lebanese grocer from Culver City, Calif."
Barrack, who is now a wealthy real estate investor, recalled how he met Trump in the 1980s, while negotiating the sale of New York's Plaza Hotel. "I was a young pup. He was a big guy in New York at the time," Barrack said. "He played me like a Steinway piano." In fact, Trump overpaid and lost the hotel within a few years. But he found in Barrack a companion who shared his tastes for real estate and a celebrity lifestyle. "Donald Trump is one of my closest friends for 40 years," Barrack told the convention audience. As a young man, Barrack had worked in Saudi Arabia, and he cultivated a network of contacts throughout the Middle East. Veteran State Department adviser Aaron David Miller described Barrack as a "smart guy. Grew up speaking Arabic. Did extremely well for himself in the business world, but particularly in the Gulf." Some of Barrack's Arab business associates were alarmed during the campaign by Trump's anti-Muslim rhetoric. But Barrack reassured them and later set about making introductions in the region, first to Trump's son-in-law, Jared Kushner, and later to the president himself. Some of those early contacts were detailed in 2018 by the New York Times. "Barrack emerged, because precisely of his decade-old ties with the Saudis and the Emiratis, as the bridge that created these relationships," said Miller, now a scholar at the Wilson Center. Trump made Saudi Arabia the destination of his first foreign trip as president. And he's made strong ties to the kingdom — along with opposition to Iran — a cornerstone of his Middle East policy. Miller questioned the wisdom of that single-minded approach, especially as the Saudi crown prince has pursued an authoritarian crackdown at home and a devastating war in neighboring Yemen. "Over the last 18 months, we've accomplished very little," Miller said. "And we've allowed ourselves to be tethered to a country and an individual that have left a wake of disasters." U.S.intelligence agencies also implicated the Saudi crown prince, Mohammed bin Salman, in the murder last October of U.S.-based journalist Jamal Khashoggi. But like Trump, Barrack has been reluctant to pin blame on the Saudi leader. "Whatever happened in Saudi Arabia, the atrocities in America are equal or worse to the atrocities in Saudi Arabia," Barrack said earlier this month at a conference in Abu Dhabi. After an uproar, Barrack apologized for those comments. But he continues to minimize the role of the Saudi government in Khashoggi's death, blaming it instead on "the bad acts of a few." Separately, federal prosecutors in New York issued subpoenas this month seeking records from the Trump inaugural committee that Barrack chaired. That committee raised a record $107 million to stage the president's swearing-in. Investigators reportedly want to know how all that money was spent, where it came from, and whether any was raised illegally from foreign sources. A spokesman says Barrack does not believe he's a target of that probe. Around the time those subpoenas went out, ProPublica and WNYC published a memo from Barrack's investment firm, drafted soon after the inauguration, showing how the firm might capitalize on its close ties to the new administration. The memo reportedly was drafted by Rick Gates, onetime deputy to Trump's former campaign chairman Paul Manafort. Gates worked as a consultant for the firm until he was indicted during the special counsel's investigation. He has since pleaded guilty to conspiracy and lying the FBI. Although Barrack's firm denied acting on the memo, the watchdog group American Oversight found soon after Trump took office, Barrack and colleagues began showing up in private meetings with top Cabinet officials. "We're seeing him everywhere, getting the kind of access that, well, frankly people would pay a lot to get," said Austin Evers, the watchdog group's executive director. On Tuesday, the House Oversight Committee listed Barrack as a key supporter of a plan to supply nuclear technology to Saudi Arabia despite warnings from whistleblowers that it might help the kingdom to develop nuclear weapons. "This is a five-alarm fire when it comes to ethics and potential improper influence on our most important policy which is national security," Evers said. Barrack said through a spokesman he's ready to cooperate with the Oversight Committee. The spokesman pointed to Barrack's four decades of "respected relationships" in the Middle East. He also stressed that Barrack has never held an official position inside the Trump administration.